Posted on October 21, 2015	by Katy K.
This book was making the rounds of my favorite blogs – The Book Smugglers, Charlotte’s Library, By Singing Light – and I couldn’t resist it. It’s one I loved so much that I don’t know if I’ll be able to say anything coherent about it. Shadowshaper by Daniel Jose Older. Scholastic, 2015. Our heroine is teenaged Sierra, a dark-skinned bilingual girl of Puerto Rican extraction, who lives in an accurately diverse Brooklyn neighborhood, Bedford-Stuyvesant. (‘m making a much bigger deal of the diversity than it is in the book, where it’s just Sierra’s world.) I’m used to “urban fantasy” mostly being about whites and “urban literature” being about people of color doing horrible things to each other. In both cases “urban” usually comes in the same breath as “gritty”. But here, as Charlotte pointed out, it’s urban but not gritty – Sierra’s people aren’t rich or white. They stick by each other and are the kind of close-knit that suburbia pines for. So when things start going wrong, it’s not normal, and Sierra and all of her friends band together to stop it. Sierra first notices it when she sees a mural of an old friend crying. Soon she sees flickers of life in murals around town, and is asked to paint a mural as an attack on an ugly, unfinished building in their neighborhood. Hints from her grandfather, mostly incoherent after a stroke, lead her onward. She’s just finding out that cute boy Robbie from Haiti is also an artist when they’re chased by a zombie-like corpse. 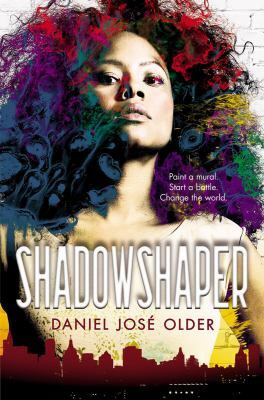 Sierra learns that she is a Shadowshaper, able to use the shades of the dead, a power that gets dangerous very quickly in the wrong hands – I really appreciated how this felt truthfully coming from her heritage. There’s action, research (helped by a friendly librarian! ), help from friends of multiple generations, uncovering family secrets and refusing to put up with old prejudices, all with just the right touch of romance kept nicely to the side. This could be perfect if you’re looking for something a little spooky for Halloween – or anytime you need a good contemporary fantasy. Side note: I gave this to one of the people at my ESL conversation group who really wanted ghost stories from around the world. Not only is it a great story in general, but fast-paced, not too long and with a straightforward narrative that I thought would be good for a non-native reader. I know, I know… you’re not supposed to give kids’ books to adult language learners, but my own experience living abroad was that children’s books are much easier to understand, both because kids are also learning how their culture works and because they don’t feel obliged to use the literary tricks that so many adult books do. Also, I nearly always like kids and teen books better. So I tell my language learners both of these things, and figure out if they’d rather have help finding adult books at their level, or if they’re OK with books for kids and teens. This entry was posted in Books and tagged contemporary fantasy, diversity, Latino/a, teen fantasy. Bookmark the permalink.